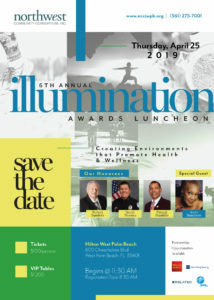 The Board of Directors and the staff of the Northwest Community Consortium, Inc. (NCCI) present its 6th Annual Illumination Awards Luncheon on Thursday, April 25, 2019 at the Hilton Hotel, 600 Okeechobee Boulevard, West Palm Beach, FL 33401. We are delighted to share that Wells Fargo and Related are supporting this event as the Title Sponsors once again. This year’s theme is “Creating Environments that Promote Health & Wellness.” This year we are honoring three outstanding community servants for their contributions to the Northwest community and the community at large. Proceeds from this event will support the development of our proposed Northwest Community Health Center as well as other programs. NCCI is a 501c (3) not-for-profit that provides a broad array of programs and services to revitalize the Northwest neighborhood in the City of West Palm Beach, Florida. NCCI and its membership aspire to improve the quality of life for all residents by providing programs and services that are transformational in nature.